Across the U.S., farmers markets are sprouting in vacant lots and under-used spaces, turning tarmac and rubble into brightly colored seasonal smorgasbords of locally grown treasures. Besides fresh fruits and veggies, many markets also offer grass-fed meat, free range eggs and poultry along with fish, jam, spices and entertainment, including cooking demos and live music; in some cities, farmers even bring their baby animals to market for petting opportunities. Type in your zip code at localharvest.org to find the markets nearest you. Here are six things your toddler can learn at the farmers market. Arrive early for the freshest picks and fresh toddler energy! Most toddlers think food just appears on the table or the supermarket shelf, prepackaged. At a farmers market kids can see the connection between nature and food. Let yours see and touch plants - with earth still clinging to the roots - sample fruits and vegetables, and meet the people who grow them. They can talk to friendly farmers or listen while you ask questions. There are often cooking demos where kids can watch a tomato get cut up and turned into sauce. That applesauce your tot eats? Here, she can see the apples in a bin and also the sauce made from those apples. Bring some goodies home for dinner or pick up dried apple chips, fresh fruit or apple cider to keep the energy level up while you roam the market. “Kids who have more control over what they eat tend to be happier and more adventurous eaters,” says Biggs, whose classes often munch on snapdragons on the way home from the market. Toddlers tend to be the pickiest of eaters. If yours will only eat food in one color, or says no to anything but white bread, a farmers market could be the answer. Farmer Jeff from Bialas Farms in Orange County, NY, loves to tell about the time a picky eater ate raw spinach from his stand in front of his disbelieving momma’s eyes. “The mom insisted, he’ll never eat that. Not only did the kid eat it, he asked for more. Kids like to sample. 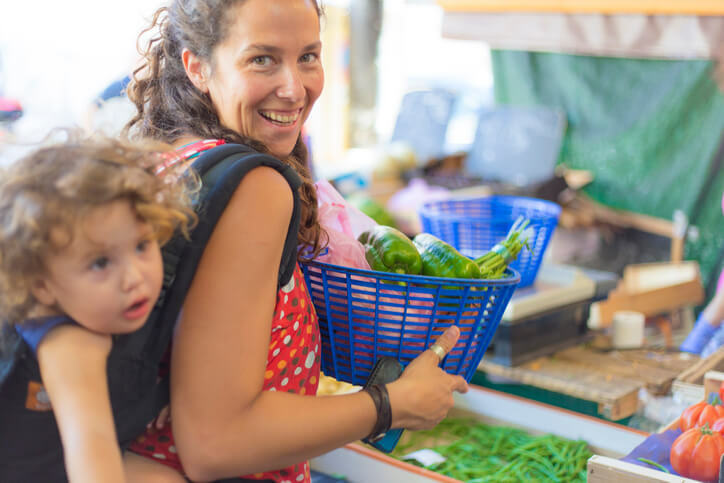 Their favorites are peas and carrots in late June and early July.” After a few trips to the farmers market, your toddler might want to help you pick out healthy treats or plan a healthy dinner. At home, they can rip the lettuce you bought for a salad or help wash or sort the veggies. Toddlers are sensory learners - that’s why they’re always grabbing things and putting them in their mouths. They also use their eyes, fingers, noses and ears to absorb information. Sure, there are books about counting and other basics; at a farmers market kids can experience quantities, colors and shapes with all of their senses. They can feel roundness; compare a big pumpkin to a miniature one; smell the herbs and learn their names; touch rough orange carrots and smooth orange apricots; and count everything. They love this kind of learning. Of course, the farmers market is also the perfect place to teach a toddler about the five senses and the rich vocabulary associated with them. Farmers usually offer bite-size samples of their local produce, as well as jams, juices, breads and cooked meats. Talk to your toddler while she nibbles. “Let’s taste this with our mouths; let’s smell the herbs with our noses.” Ask: “How does this taste? I think this green apple tastes tangy. How does this feel? I think it feels squishy.” Or, if you’ve had enough of the Mommy Asks routine, brig the stuff home and let the kid report to Dad. Each visit to the farmers market is a lesson about the seasons, the cycle of life, botany, nutrition, the planet and empirical science. Maybe last week your toddler feasted on strawberries; this week there are none. What’s up with that? This is your chance to talk about the seasons and how there will be strawberries in the spring and pumpkins in the fall. Put toddler science to work for you. Explain the difference between fruits and veggies: Fruits have seeds; can you find them? Where do these fruits have their seeds? Uh oh, the seeds on a strawberry are on the outside. You can even cut open a fruit you bought and plant the seeds in your back yard. Toddlers love to categorize and sort things, whether they’re trucks, blocks, crayons or silverware. The farmers market offers a more sophisticated version of this type of thinking. With your help. any time your toddler sees a red apple next to a green one next to a variegated one, he learns that these are all apples even though they’re not the same color. Seeing green beans next to ten varieties of lettuce, he learns that these are all green, even though they’re not all lettuces. This is complex learning that helps the brain develop more pathways and make quicker connections. And by the way, should we bring these home and cook them? Got a shy toddler? A Farmers Market could help bring her out of her shell. Especially in the Summer, these places are an interesting mix of laid back and vibrant. This makes the market a fun, safe, and inviting outdoor environment where you can help your toddler interact with people she admires or s curious about: farmers. Even if your toddler isn’t verbal enough to ask the questions herself, most farmers are willing to offer information about farms, growing veggies, and even animals. “It’s fun to talk to the little ones,” says poultry farmer Permanand Raghoo. “They’re curious. We tell them about eggs and chickens, how the chickens hatch and how we feed them. They really enjoy it.” Toddlers also gain experience taking turns in a non-competitive environment - for instance, waiting for samples. And because this is a kid-friendly environment that’s nevertheless not focused on kids, it’s a perfect place for a toddler to quietly check out the community and get comfortable in a social space that’s both and non-threatening.